This interview with Carole Wilson is part of a large-scale video installation Paradise by Turkish artist and filmmaker Kutlug Ataman. 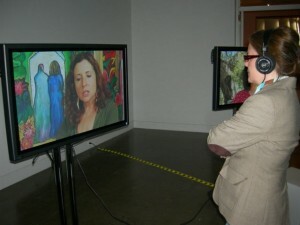 Filmed primarily in Los Angeles in 2007, the work focuses on the concept of “paradise” as seen through the eyes of Angelenos. 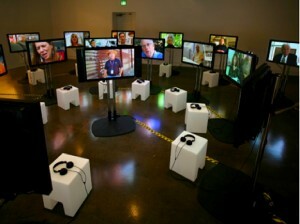 Jointly commissioned by the VAG and four other art institutions in Europe and the United States, it is comprised of 24 interviews with residents of Southern California, running on 24 flat-screen video monitors arranged in two concentric circles. In it, Ataman’s subjects respond to his question about the idea in the work’s title, a kind of heaven on earth. “I wanted to go to an area that brands itself as paradise,” he says. “I wanted to look at the kind of people who live that dream.” He was also interested in revisiting Hollywood’s environs, where that dream is manufactured for the rest of the world.